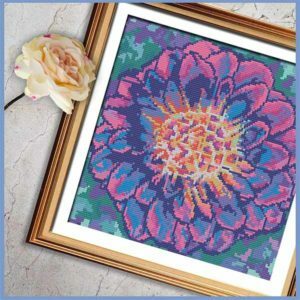 Who doesn’t love a cross stitch pattern flower to brighten up your day! Enrich your home with the colours of royalty with the Purple Dahlia pattern! This lovely vibrant pattern is based on the upper left panel of the Solarize Dahlia pattern set. 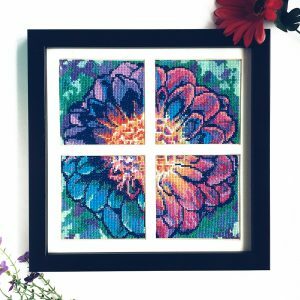 With limited colours and only full stitches, this graceful dahlia is a good project for even beginner stitchers to create. 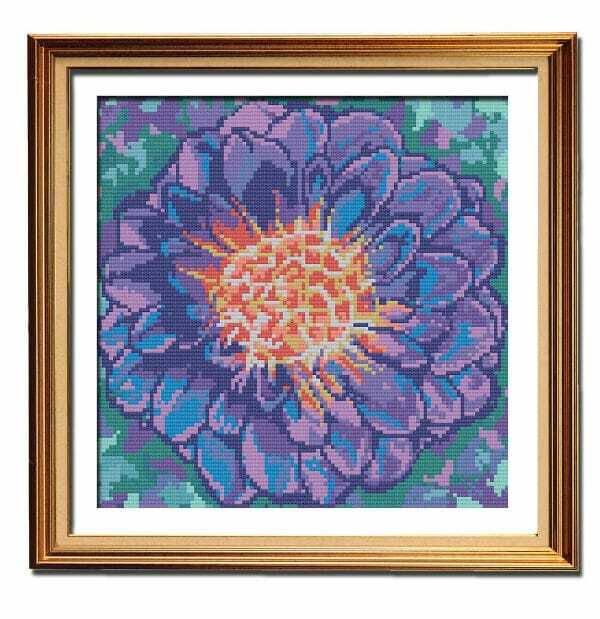 If you’re looking for a cross stitch pattern flower, then bring a little royal elegance into your life with the Purple Dahlia pattern. 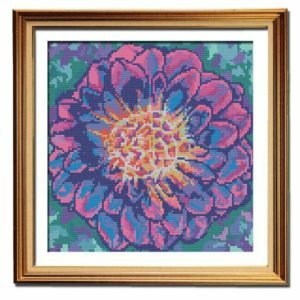 Liven up your decor with the stunningly vibrant Fuchsia Dahlia flower cross stitch pattern. Featuring luscious pinks and purples, this beautiful pattern is sure to add a colourful statement to any wall. This lovely dahlia is based on the lower right panel of the Solarize Dahlia pattern set. This pattern uses limited colours and full stitches only, so it’s even suitable for beginners who want to start stitching bigger patterns. 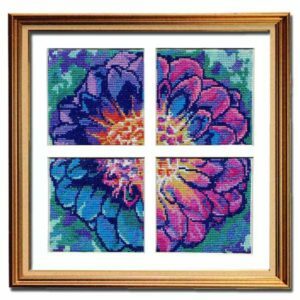 Ban boring from your decor with the uplifting Fuchsia Dahlia flower cross stitch pattern. 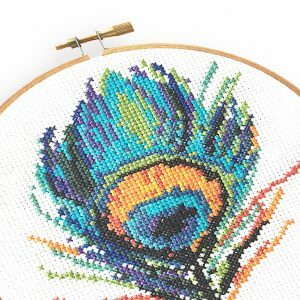 This gorgeous simple cross stitch pattern makes a lovely graphic statement, and can be stitched in a myriad of colours. It’s also a great project for using variegated floss. 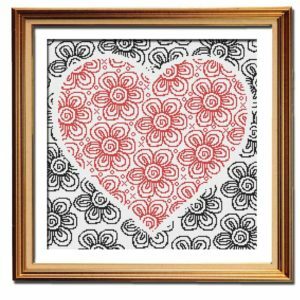 The Flowers of Love pattern is a customer favourite, and is perfect for beginner stitchers to practice following a pattern. It also makes a gorgeous gift to show your loved ones you are thinking of them. 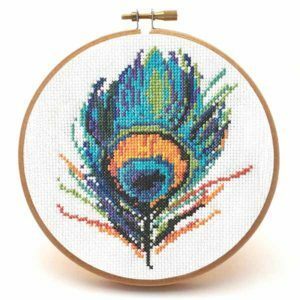 The beautiful Peacock Feather cross stitch pattern was inspired by a vintage illustration, and was created to celebrate the opening of the Peacock & Fig shop. A customer favourite, this pattern is great for beginner stitchers that are wanting to tackle their first multi-colour project as there are limited colours and the finished size is only 5″ wide by 6″ high (if stitched on 14 count fabric). Add a touch of elegance and vintage whimsy to your decor with the Peacock Feather pattern. Do you love cross stitch ornaments, but want to stitch something a little different than a traditional snowman or Santa? 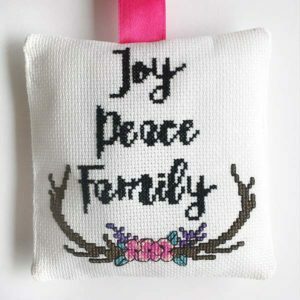 The Joy Peace Family cross stitch ornament pattern features a simple boho-style design which will complement your modern Christmas decor. This ornament also comes with a free video tutorial (and full colour assembly instructions). Not only can you learn how to assemble this pretty ornament quickly and easily, you’ll learn how simple it is to turn any small pattern into an ornament. You can even turn this pattern into a pincushion, or pretty hoop art. 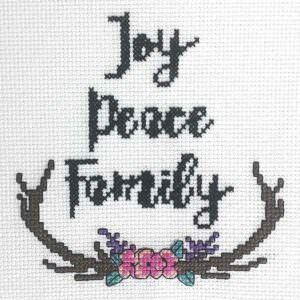 Joy Peace Family features full cross stitch and backstitch. 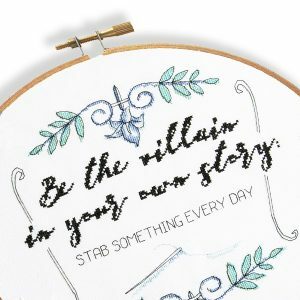 It’s an ideal pattern for beginner stitchers to practice backstitch due to its small finished size, and it’s perfect for whipping up a quick last-minute gift. Add a little modern elegance to your Christmas decor with this lovely cross stitch ornament pattern. 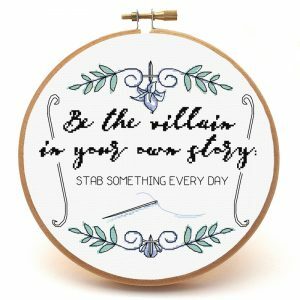 As seen in the December 2016 issue of Kindred Stitches. 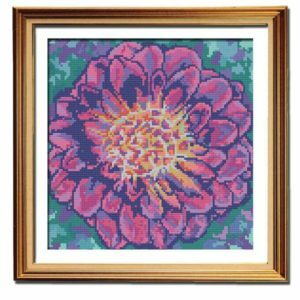 Be bold and make a statement with your decor with the Pink Marbled Dahlia flower cross stitch pattern. Featuring electric blues, purples, and pinks, there is nothing shy about this vibrant pattern. 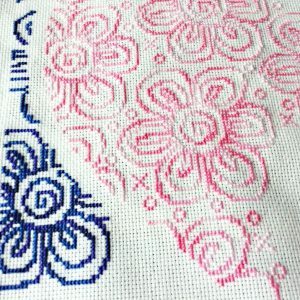 Since this pattern has limited colours and uses only full stitches, even beginner stitchers can feel comfortable tackling this as their first larger pattern. 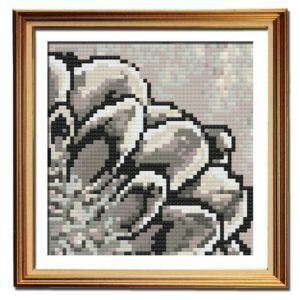 This flower cross stitch pattern is based on the upper right panel of the Solarize Dahlia pattern set. Show off your personal style at home with the Pink Marbled Dahlia pattern. 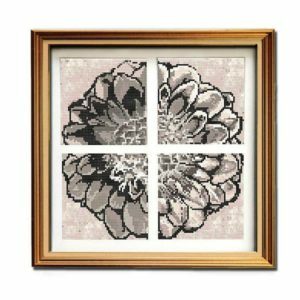 The Rustic Dahlia cross stitch charts will add a touch of country chic to any home. The soft pinks and greys will complement any decor. The set consists of four cross stitch charts, which can be stitched individually or on one larger piece of fabric to create one image. This pattern is full stitches only, with no back stitch. These patterns are a PDF download, so you can purchase them and get started on your newest project straight away!